The Australian Golf Media Association (AGWA) announced the winners of this year’s Australian Golf Media Awards at a function held in conjunction with the Australian Open at The Lakes Golf Club in Sydney. The night was well supported by many of the major people in the Australian golf industry including Australian Open defending champion Cameron Davis and rising stars Harrison Endycott and Travis Smyth. 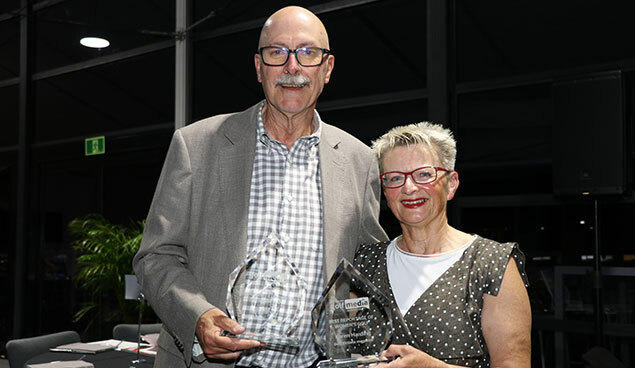 The evening also saw the 20th presentation of the Australian Golf Media Awards, with Golf Australia magazine feature writer and columnist Brendan Moloney being the big individual winner. He won the Best Long Form Story for his moving tribute to Peter Thomson, who passed away in May. Moloney was also presented the Tom Ramsey Memorial Award For Excellence in a career that has spanned more than four decades. Golf Victoria Magazine collected three gongs with Karen Harding awarded for best reportage on women’s golf, columnist Mike Clayton winning the Best Opinion Piece for his thought-provoking ‘Money The Answer To Open’, while artist Paul Harvey was awarded Best Photographic/Illustration presentation. PGA TV collected the gong for Best Visual Presentation for its “World’s Biggest Bunker” video, while SEN radio presenter Andy Maher received the award for Best Aural Presentation for his compassionate live interview with Jarrod Lyle shortly before he passed away.